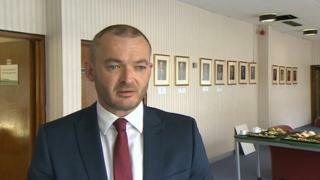 A council leader embroiled in a row over the sacking of his deputy has announced his decision to quit. Aaron Shotton, Labour leader in Flintshire, said he was stepping down to "heal the political divisions that have emerged in recent days". Last week he dismissed Bernie Attridge as his deputy for breaches of confidence leading to a loss of trust. Cabinet colleague Carolyn Thomas warned earlier that "hatred and animosity" threatened to split the Labour group. The two men - who both represent Connah's Quay Central ward - had become embroiled in a war of words since the dismissal, which was backed by a majority of the ruling Labour group, according to the Local Democracy Reporting Service. Residents angry at the decision have already gathered in a public show of support for Mr Attridge at a pub in Shotton, with further protests planned for a community meeting in Connah's Quay on Wednesday. In a statement issued ahead of the meeting, Mr Shotton announced his decision to resign for the sake of his well-being and that of his family, saying: "The increasing pressure is intolerable." He said he was "grateful" for the support of council colleagues, but added: "In the light of increasing and persistent social media attention, and the community reaction to the decision that I had to make, I have considered what is best for the council moving forward. "I strongly feel that in order to heal the political divisions that have emerged in recent days, it is now necessary to step aside from the role of council leader and cabinet member for finance. Mr Shotton, who is the subject of an ongoing Ombudsman's investigation into his conduct, also said he would be leaving his role as cabinet member for finance. Earlier, Ms Thomas appealed for calm between supporters of the two men. "They worked together as an excellent pair and it is dreadful it has come to this hateful, public display of destroying two lives," the cabinet member for streetscene and countryside said. "It could cause a split and bring down the council which stops it functioning properly." A special full meeting of Flintshire County Council will take place next Tuesday to elect an interim leader. They will serve at least until the annual general meeting in May, when the authority will confirm its leader for the coming year.